Bruce Page is the next generation of classic blues guitarists. His work has been compared to BB King but he has his own individual style. Laid back and blue is the way he plays. No screaming guitar parts just the smoothest lead guitar sound around. Bruce studied music in St. Louis at the Community Association of Schools For The Arts. He began playing guitar at age 16. Bruce found the Blues at age 22 and he's never left them. His music is heavily influenced by the three Kings; BB, Albert, and Freddie. 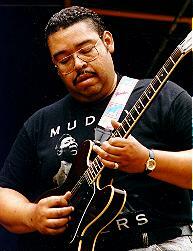 His guitar work can be heard on the recording, Hairy Larry and The Flying Hungarians; "Live at Blues Alley".